Not sure if you remember, but I started this project while in San Diego this past December. My MIL asked me to make her an afghan to go in one of the guest bedrooms that she just redone. She picked out a pattern out of one of the afghan books that I had and we gathered swatches of the fabric she brought back from her trip to France and we high tailed it to the local Michaels. 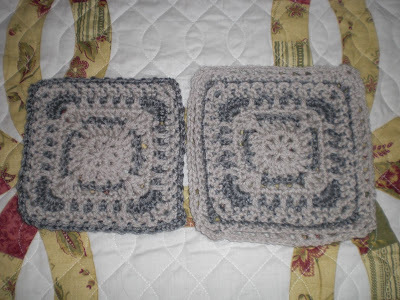 These are the two colors she picked: Vanna's Choice, in Linen and Simply Soft , in Grey Heather. . The pattern called for 3 colors but she wanted only these two so I altered the pattern and this is how it will look. 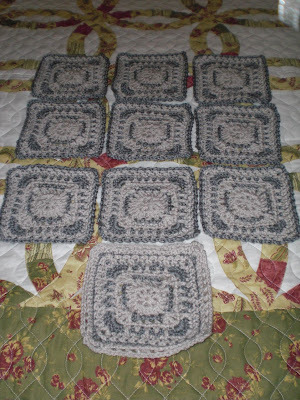 I have almost all 40 squares with 8 of the 10 rounds completed. You can see in the photos the one square that is complete. I think once it is together it is going to look so beautiful. I just know that she is going to love it. If you know me, you know that I am not wild about putting squares together. I don't mind making the squares but I detest putting them together, (maybe because I am so bad at it). Anyway I have been working slow in this one and working on it mostly weekends only. Now that it is getting close to being finished I am working on it more. I will post a photo once it is completed. Remembering you always sister my own! Sis I wanted to do a very special post dedicated to you to let you know how much you mean to me and how important you are in my life. 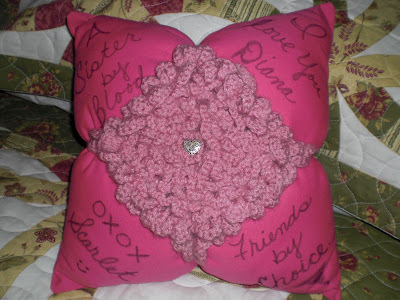 I made this pillow special with all the love in my heart to show you just how special you are. 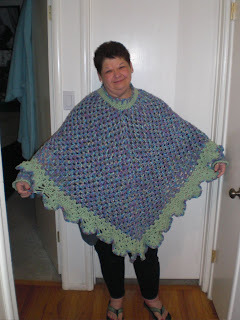 I know when I left you last night you thought I would be working on the poncho but i changed gears fast so that I could get it finished tonight. 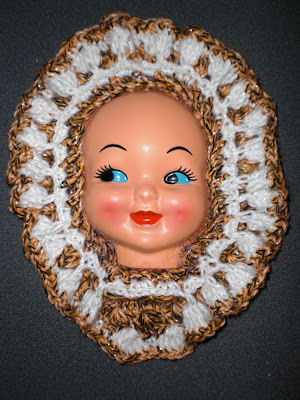 The pillow form was made by Jean at my RA Yarns and More group. She does a wonderful job and I have known for a long time that I wanted to do something special with them and one of them called out to me tonight and I thought of you immediately and off I went to look for something to do with it. Below are my efforts. I hope you like it. Well I am having a bad hair day in this one. I just had gotten out of the shower about 45 minutes before the picture and I had not done my hair. Well now you've seen me without my hair done. I think it was the same case in the last photo as well. Anyway here is the wheel chair cape that I did like the one sis made. I just used a button for the closure. Not sure I like the color. I used Red Heart Strata in Confetti and I think it is way too .....wild is the word I guess I am looking for. I hope you all are having a great week. 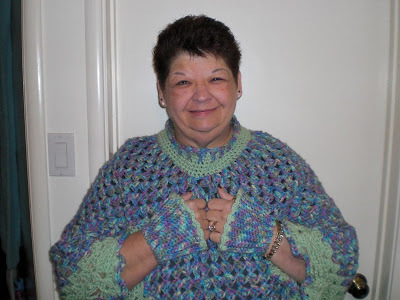 I received some beautiful pet pads in the mail yesterday from Diane and more today from Wendy and June. They are so wonderful. Thank you all so much. Tony and Pam report that the kitties are loving the snuggles and she has enough to wash them so they always have clean ones. When sis comes this month she will get to me Tony and Pam and I am also trying to see if Tony can get some pictures for me to post. Thank you all again for such a wonderful response and support.